The River Loddon arises from chalk fed springs in Basingstoke and flows north easterly for 49 km (30 miles) before joining the Thames near Wargrave, a few miles north-east of Reading. There are three main tributaries: the River Whitewater, River Hart and River Blackwater. Together with its tributaries, the Loddon drains an area of 681 km² (263 square miles) stretching between Hampshire, Berkshire and Surrey. One of the defining features of the Loddon catchment is the varied geology through which the rivers flow. Whilst chalk underlies much of the Loddon catchment, it only surfaces at either end of the river, in the south-east around Basingstoke and in the north around Wargrave. Everywhere else the chalk lies deep underneath Eocene formations: the London Clay which surfaces on the eastern part of the catchment, and the sands, silts and clays of the Bagshot, Camberley and Windlesham formations. This varied geology has resulted in a large diversity of soils: the Eocene sands are mainly associated with podzolic soils, the London Clay with gley soils, and the chalk with lithomorphic and brown soils. In turn this diversity of soil types leads to a large diversity in land uses and habitats. The Loddon catchment is predominantly rural with much of the catchment being used for agriculture. Urban and suburban development accounts for 39% of the land area with the main urban centres being Basingstoke, the east of Reading, Bracknell, Wokingham and the Camberley-Farnborough-Aldershot conurbation. It is therefore one of very few catchments that incorporates a complete urbanisation gradient, with the University of Reading at the urban frontier. Environment Agency investigations show that physical modifications, pollution from urban and rural areas, and waste water are key challenges to the water environment in the Loddon catchment. 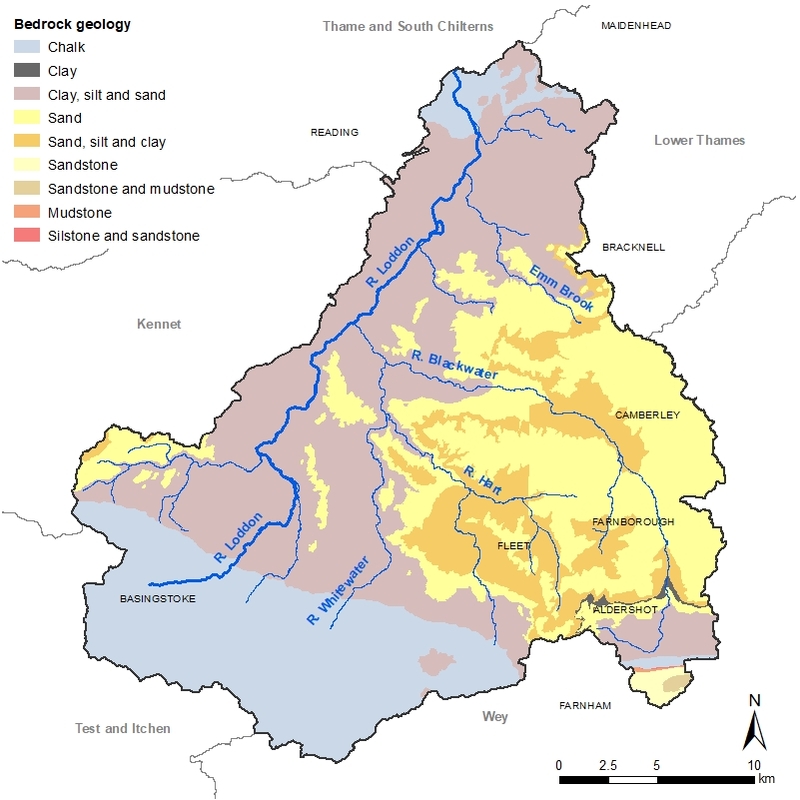 Further information on the pressures that the Loddon and its tributaries face can be found on the Environment Agency’s Catchment Data Explorer. Find out more by searching the Loddon Observatory online library for published research literature describing work undertaken within the Loddon catchment. 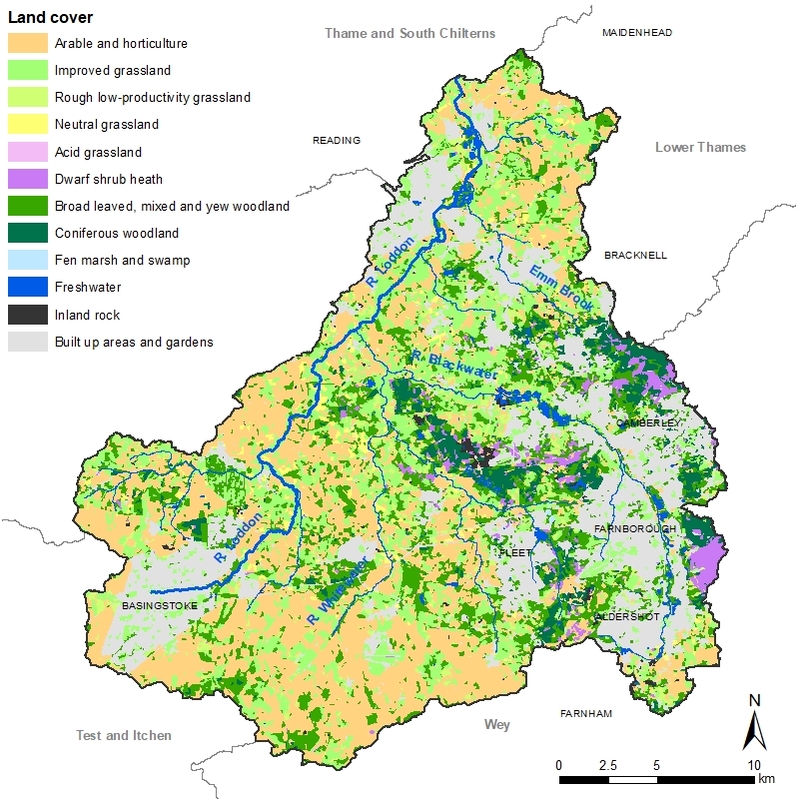 Habitats: NERC (2011) Landcover Map 2007. Data obtained under non-commercial licence. Centre for Ecology and Hydrology (CEH), Oxfordshire. 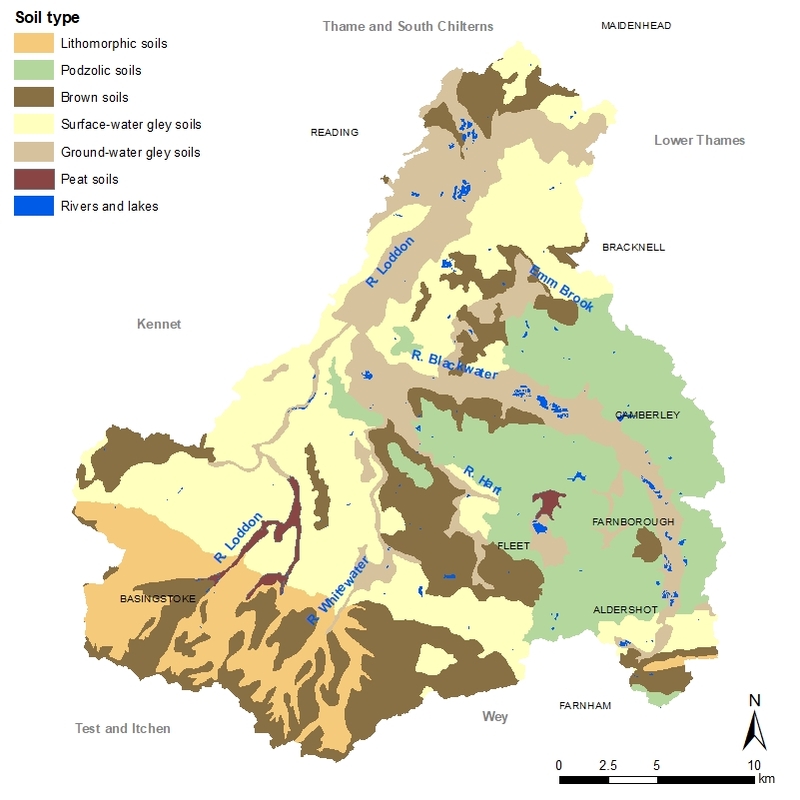 Soils: Cranfield University (2004) The National Soil Map and Soil Classification. Data obtained under non-commercial licence. Rivers & Lakes: Ordnance Survey (2016) OS Strategi®. Data obtained under Open Government Licence. OS Open Data. Geology: British Geological Society (2013) 1: 50,000 Bedrock Geology. Data obtained under licence. Edina Geology Digimap. River catchments: Environment Agency (2014) WFD Management Catchments Cycle 2. Data obtained under Open Government Licence. Geostore.